The last thing Katie Bonner wanted was to become the manager of Artisans Alley. But when her business partner, Ezra Hilton, is found lying at the bottom of a staircase, bludgeoned to death, she has no other choice. A collection of booths for artisans and craft sellers in a renovated applesauce factory building, Artisans Alley is the main attraction in the quaint Victoria Square shopping area. But business under Ezra had been faltering-enough to provoke someone to murder? 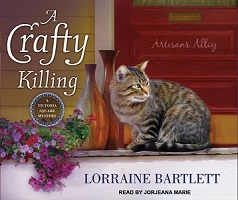 While the cops are proceeding by the book, Katie is investigating by the booths-for the answer to the killer’s identity lies in the hidden secrets of Artisans Alley itself. 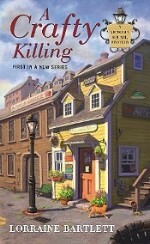 “A Crafty Killing is a fantastic start to a new cozy series. 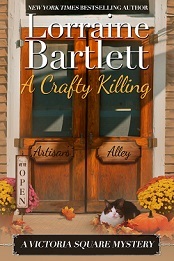 Ms. Bartlett has created a warm, inviting town where everyone is on a first name basis and murder is a rarity. The characters are quirky, yet relatable. They are begging to tell you the rest of their story. Ms. Bartlett has laid the perfect groundwork for future books in this series that introduces us to Katie and the people who sell their wares at Artisans Alley. Will Katie run Artisans Alley long enough to turn it around and sell it for her dream B&B, or has she found a new dream? A Crafty Killing kept my attention from the very first word until I turned the last page. The red herrings were aplenty, and the killer a complete surprise. Ms. Bartlett has created a crafty tale that must be read. “Fun plot, fanciful characters, really fabulous crafts. A palette of colorful characters and enticing crafts. Bartlett put her art and soul into this mystery! —Julie Hyzy, author of the Barry and Anthony award-winning White House Chef Mysteries and the Manor House Mysteries. “To avert suspicion?” Katie asked. “You’ve been watching too many TV cop shows,” Seth said, amused. “You might be looked at as a suspect yourself,” Seth admonished. “And you didn’t tell me?” Katie asked, forgetting about dessert and setting her fork aside. Did you ever wonder where the various businesses are located on Victoria Square? Check out the maps page.